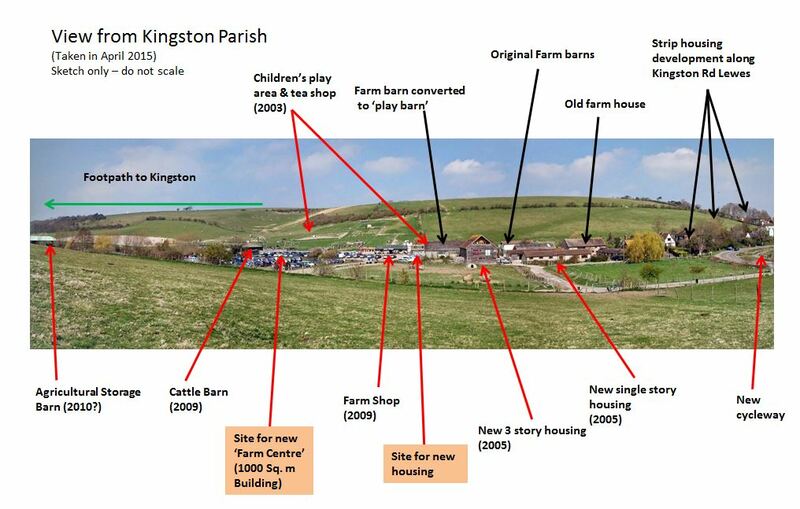 Earlier this year the SDNPA Planning Committee supported local residents by refusing a planning application which would seen the building of a large (1084 sq m) ‘warehouse’ type building over 25 feet high on farmland in the South Downs valley between Kingston & Lewes parishes amongst other building. Here you will see the inspector’s letter and all the application documents. The principle of a children’s play area (though a little expensive for the average parent) a farm shop and cafe constructed a few years ago has been a great addition to the area. However, many people don’t like the large 3 story residential building which detracts from the beautiful valley scene. However that past planning mistake is past history now. 1) The development is adding more buildings in a small, beautiful valley in the South Downs. The large industrial style building set further out into the downland valley is out of keeping and destroys the rural nature of the area. The large, 1000 sq m, 7.65m high, industrial style building will be a prominent permanent eyesore in the once beautiful, peaceful and tranquil valley. I hope the members and officers appreciate its size and scale – it is approximately 2 ½ times the size of the existing large farm barn next to where it will be sited. 2) The building of houses further extends residential development on the land between Lewes and Kingston. This could set a precedent for further development. 3) The NPPF does not seem to be adhered to by the developer with respect to consulting and working with the community: “66. Applicants will be expected to work closely with those directly affected by their proposals to evolve designs that take account of the views of the community”.